Amar Singha was born and brought up in a baronial family of the north Bengal. In his childhood, he got color pencils, crayons and drawing sheets to avoid his loneliness. Behind the royal flamboyance, he had a lot of curiosity which he tried to put down on the drawing sheet. That childish game is now converted into a meaningful craft of his life. He took admission in the Ramakrishna mission primary school in Calcutta and after a few years, he gets back again to their own high school and then college. After obtaining the graduation, he got a chance to admit in art college of Calcutta. In the final year of art college, his father expired and within a few years, he leaves their ancestor's palace forever. Presently, he is residing in his own house and continuing painting in the studio. Statement - The painting he formed in an exceptional way that revealing himself and the world around him. In the language of color, his painting trumps up the joy of human life and make visual poetry on canvas. Uses of contrary color in painting produce the delights of living. The blank white space came as the symbol of eternity that respectively bears a calmness. It seems to be indicating something around the past experience of his spiritual life, unconsciously. Having affection for human life, it's an endless journey to the infinity. From the structural perspective, his painting based on synthetic cubism - which later becomes standard in Indian style. He texturized painting especially that indicates the home-craft of rural Bengal that is also very near to the texture of jute. It's a uniqueness that makes his painting stand out of others. Throughout the game of reconstruction of the form, he reached to that imaginative world whose bless helps to become eloquent his canvas. Rather than passing in the Indian two-dimensional trend, the tenderness of light and shadow brings his thoughts back to life. The use of the line shows the eternal idea of the Indian drawing which he makes his own. From the grammatical perspective, his painting dominates the Indian custom, and in the framework of the ritualized Indian grammar, he configured the western ideas. The flows of two different visions come into the key-point that help him to plan his composition which significantly makes his painting unique. The masterpieces of the ancestor Indian artists have inspired him to move forward. By his creation, he has tried to find out the survival supply of human beings that have the address of joy. In his painting, he finds the stuff of surviving as well as the meaning of living that will inspire others to take a few more time from God to have the flavor of human life. Oil is the primary medium that I practice in my own style. Lord Ganesha is one of the most popular Hindu Gods considered as the symbol of success. According to mythology, the figure of Ganesha made by his mother from her body dirt while she was taking a bath. Lord Ganesha is known as the son of Lord Shiva and Parvati and he assumed the spiritual power of his parents. In the painting, Lord just in the pleasant mood and ready for compassion to all the devotees by the blessing gesture of his right hand. Red is the favorite color of Ganesha that I used in my painting. The painting describes the eternal emotional relation between male and female that inspire me to express on canvas. In the interior village of West Bengal, 'Baul' is one of the well-known branches of the Vaishnava community who perform self-composed songs that mainly based on the spiritual manner indicates the uncertainty of mortal human life. They mainly travel by walking miles after miles and prefer to dance with their songs. Begging is their main source of earning in return for their wonderful mind blowing song. My painting just describes those outstanding songs I have heard in several times under the open sky while walking on the village pathway. The painting about the traditionary lifespan of Indian rural villagers. Bringing water from the local ponds, return of the cowherds with cows from the pasture, whispering voice of interacting between village housewives and the reddish sky of the evening; all compose an emotional rhythm of poetry that only be embraceable by a sensitive soul. The painting about the eternal heavenly relation between Radha and Krishna which is out of any physical entrance. It's very near to the concept of Platonic Love. Such a relation inspire me to make the painting. 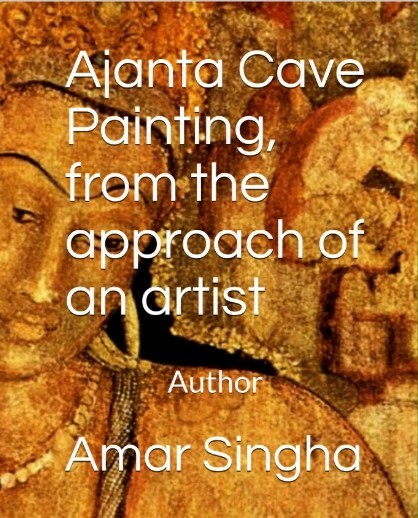 I am not an author, rather an amateur blogger and the books listed here are composed by the articles first published on the award winning Indian art blog named - Painter's Blog.